One of the Monster Energy Series signature racing events is Monster Jam. It has to be one of the most entertaining motorsports contests directed towards family fun and entertainment. There is something about watching these huge custom built vehicles, launching themselves over dirt berms and getting totally off the ground ("Getting Air") that is just so much fun to watch. This picture was taken during the free style segment of the Monster Jam competition where just a single truck takes to the course at any given time. This is a great opportunity for the motorsports racing photographer as they can devote their entire attention to just a single competitor on the track. The vehicles usually move in a somewhat predictable fashion lining up for the upcoming manuever. Capturing one of these awesome machines, performing their gravity-defying feats always yields an photograph with amazing impact. 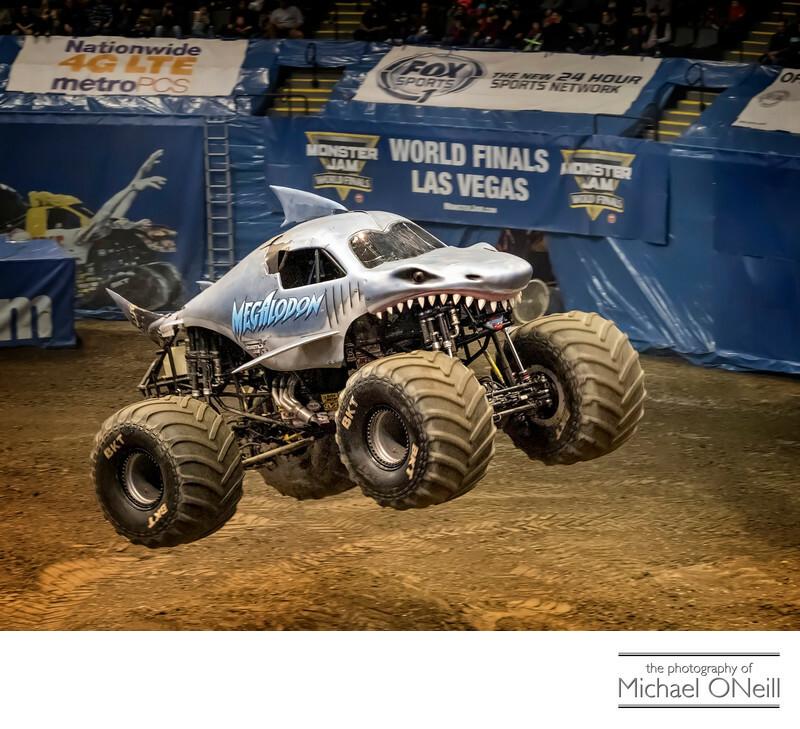 Check out how this truck, "Megalodon", is captured in mid air…all four of it’s tremendous tires having left the ground. This picture was taken indoors at The Nassau County Veteran’s Coliseum in Uniondale, NY on Long Island at the Monster Energy Monster Jam event. A great number of the Monster Energy Monster Jam events are held in indoor arenas. These huge powerful machines racing around an indoor track creates sights and sounds the likes of which you’ve never experienced. Maybe these machines don’t have all of the style and popularity of more exotic racing vehicles such as NASCAR cars or MotoGP Motorcycles. It doesn’t matter. All racing events cater to the spectators…the sport’s most loyal fans. Monster Energy’s Monster Jam Series has a huge following to support their sport and all of the corporate sponsors that are involved in bringing the action to you. If you’re looking for an experienced, diverse photographer to cover any upcoming speed contest give me a call. My East Northport, NY studio is convenient to all racing venues in the Northeast and Mid Atlantic regions of the US. I am also available to travel for motorsports assignments anywhere.